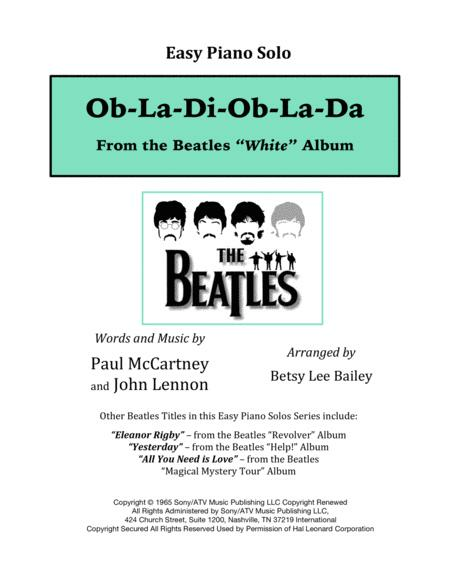 By The Beatles. Arranged by Betsy Lee Bailey. 3 pages. Published by Betsy Lee Bailey (H0.148671-604200). 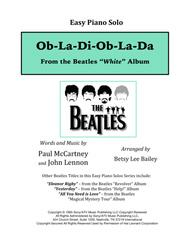 2016 Easy Piano Contest Entry﻿ "Ob-La-Di-Ob-La-Da" - Easy Piano Solo is upbeat and fun to play for Grade 3 and above. The syncopations and harmonic figures fit nicely within chord formations. A fun challenge piece for recital, particularly for the Older Beginner!